view-html.r is an introduction to the ease of gui creation with REBOL/View, plus the ease and simplicity of accessing internet URLs. widget Window Gadget, REBOL/View uses the term face for buttons, text areas and other windowing gadgets. The above image was created running REBOL/View 2.7.5.4.2 GNU/Linux 4.0, KDE Desktop. and has been cropped for space. %webprint.r that is more like the sample D program listed below, in that there is no gui involved. REBOL/View gui building is easy. view layout [...gui specification...] How cool is REBOL/View? Please compare the read http://www.rebol.com 25 character sequence to this D language program (which doesn't have a window by the way, just text output to a console). This particular example does not have scroll bars. 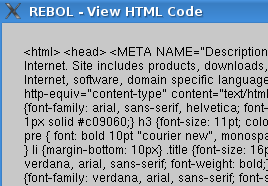 Not hard to add, but in this case, there is more text on the rebol.com home page than will fit in the window. You will need access to the internet and rebol.com will have to be up and running for this script to work. Don't worry, rebol.com is always up and running. REBOL/Core will not have the view or layout functions defined. You will need to start up REBOL/View.